In addition, this book includes examples gleaned from the authors' collective years of experience and expertise in a complex urban healthcare market with large for-profit, not-for-profit, and public (county, state, and federally funded) healthcare organizations and systems. Dr. June Marshall, DNP, RN, NEA-BC, has a diverse career in nursing that spans more than four decades. Her roles include direct care nurse, clinical nurse specialist, nurse entrepreneur and consultant, educator, researcher, and nurse leader. Dr. Marshall received her BSN from Texas Woman’s University, her MS (Nursing) from Virginia Commonwealth University-Medical College of Virginia, and her Doctorate of Nursing Practice (DNP) from Texas Christian University. Dr. Cole Edmonson, DNP, RN, FACHE, NEA-BC, FAAN, has a career spanning two decades with roles including clinical nurse, supervisor, manager, director, associate chief nursing officer, and his current position of chief nursing officer. He is a fellow in the American Academy of Nursing and the American College of Healthcare Executives, and is Nursing Executive Advanced-Board Certified by the ANCC. He is a Robert Wood Johnson Foundation Executive Nurse Fellow Alum. He completed his BSN and MSN at Oklahoma University College of Nursing and his DNP at Texas Christian University. Victoria England, MBA, BSN, RN, NE-BC, is the director of nursing excellence at UT Southwestern Medical Center at Dallas, overseeing Magnet accreditation. In this role, she works with the executive leadership team and direct care staff in promoting nurse excellence throughout the organization. 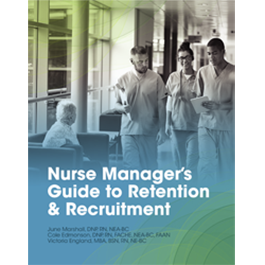 Nurse retention and recruitment within hospital and ambulatory settings is England’s passion. England received her Master of Business Administration from Amberton University and her Bachelor of Nursing from University of Texas at Arlington. She holds Nurse Executive Certification and is currently pursuing her DNP.